Nuffield International inspires people to make a difference in the world of agriculture. This work is done by developing the individuals in agriculture who will shape the future of agriculture and our local and global communities. A non-profit organization with a global footprint, Nuffield International encompasses our member countries of Australia, Canada, France, Ireland, Netherlands, New Zealand, United Kingdom, and Zimbabwe. In addition, Nuffield International leads efforts to support the engagement of the program into new countries. Currently, Nuffield International is administering the development of the scholarship program in Brazil, Chile, South Africa, and the United States of America - with a view to continually expand this unique opportunity to other agriculturists from all over the world. With more than 1700 Nuffield Scholars around the world, these individuals are running farms and agribusinesses, leading communities, serving as elected officials, and shaping global agriculture practices and policies. Each Nuffield Scholar steps out of their own life and activities during the year of their scholarship to explore the world to find new best practices, ideas, insight, and resources to carry back home. Whether they are investigating production agriculture, financial and succession planning topics, market trends, or communications and outreach efforts, Nuffield Scholars dig into a topic of interest to them and of value to the industry. Through this journey they become experts in their area of study, and an invaluable resource to those around them. All Nuffield Scholar study reports from 2006 on are available on this website. We encourage you to visit and revisit these reports to learn about agriculture around the world, and glean insight on the future of agriculture. The ethos and focus of the Nuffield International program owes a lot to its founder, William Morris (who later became Lord Nuffield). Morris, an industrialist and philanthropist in the United Kingdom, made his fortune building bicycles and later launching Morris Motor Company. As part of his journey to learn about building cars, Morris sought out other leaders in the sector to see what they were doing. This curiosity, experiential learning, and transformative travel helped shape his success, and it is the foundation of the journey each Nuffield Scholar undertakes. More detail on William Morris, his career and philanthropic focus, and the establishment of the Nuffield Farming Scholars program in 1947 can be found in the book Nuffield, The Man by Caroline Nixon. Being selected as a Nuffield Scholar is a privilege that not all who apply enjoy. It is an incredibly competitive program, and there are typically only 70 to 80 Nuffield Scholars per year. It is, however, a highly regarded network of agricultural leaders whose insight is sought around the world. This annual event is the blast-off for each new Nuffield Scholar. The entire group gathers together for one time only, spending eight days exploring agriculture in the host country, learning more about themselves and each other, and engaging with leaders in agriculture who help reinforce the Nuffield vision and values. A number of Nuffield Scholars participate in a GFP experience, where a small group of 8 to 10 Scholars spend six weeks on the road together. The groups have the opportunity to dig into agriculture in up to seven countries, literally making their way around the world as agricultural explorers. For many participants, the GFP experience is the hallmark of their Nuffield travels, broadening their horizons, cementing friendships, and giving them the chance to understand other cultures and countries on a deeper level. Every Nuffield Scholar spends time traveling to investigate their individual research topic. The culminating requirement of a Nuffield scholarship is a 10,000 word report, which is made publicly available and adds to the knowledge base available to those in agriculture and those looking to learn about agriculture. Nuffield Scholars typically also give multiple presentations on their study topic, findings, and experience. Following the travel time and report presentations, Nuffield Scholars are often highly sought speakers for agricultural and community groups at home and abroad. They are looked to as leaders in the field, and translators for what is happening elsewhere in the world. Every three years all Nuffield Scholars are invited to attend the Nuffield Triennial. This engaging two week gathering is supported by Nuffield International and provides attendees with the chance to renew their Nuffield network, share in professional development with other curious leaders in agriculture, and explore a new host country where top agricultural operations are opened to the group. Watch a video produced by Nuffield Ireland about their 2014 Scholars which highlights the benefits of a Nuffield Scholarship. 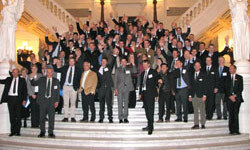 Nuffield scholars at a gathering in the USA. A benefit of a Nuffield Scholarship is the opportunity to travel and gain firsthand knowledge of farming methods in other countries. 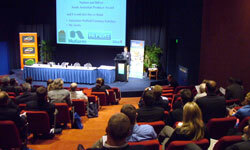 Nuffield organizes regular conferences where industry representatives are invited to speak on new ideas and innovations.